This book is a concise, evocative, and thoroughly researched study of one of the great rock'n'roll pioneers. After "Tutti Frutti," Little Richard began garnering fans from both sides of the civil rights divide. He brought black and white youngsters together on the dance floor and even helped to transform race relations. In June, 2007, Little Richard's 1955 Specialty Records single, "Tutti Frutti" topped "Mojo" magazine's list of '100 Records That Changed the World'. But back in the early 1950s, nobody gave Little Richard a second glance. It was a time in America where the black and white worlds had co-existed separately for nearly two centuries. After "Tutti Frutti" Little Richard began garnering fans from both sides of the civil rights divide. He brought black and white youngsters together on the dance floor and even helped to transform race relations. 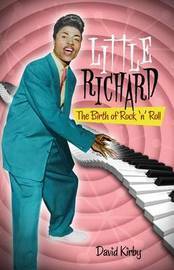 "Little Richard: The Birth of Rock 'n' Roll" begins by grounding the reader in the fertile soil from which his music sprang. In Macon, Georgia, David Kirby interviews local characters, who knew Little Richard way back when, citing church and family as his true inspiration. Kirby sees Little Richard as a warrior, one fighting with skill and cunning to take his place among the greats. In the words of Keith Richards (on hearing "Tutti Frutti" for the first time), 'it was as though the world changed suddenly from monochrome to Technicolor'. Those sentiments have consistently been echoed by the music-listening world, and the time is ripe for a reassessment of Little Richard's genius and legacy. David Kirby is the Robert O. Lawton Distinguished Professor of English at Florida State University and lives in Tallahassee, Florida with his wife, the poet Barbara Hamby. He is the author of thirty books including The House on Boulevard St.: New and Selected Poems, which was a finalist for the 2007 National Book Award. He has written on music for The Chicago Tribune, The New York Times Book Review, The Washington Post, and others. For more information visit www.davidkirby.com.